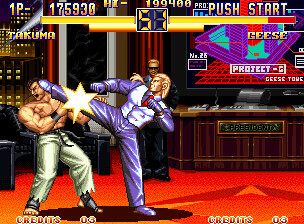 Extra Power (Neo Geo AES): It is possible to use Art of Fighting's save right when beginning an AOF2 game. All bonuses gained during Bonus Games in AOF 1 are kept here. Just choose 'LOAD GAME' when you are asked to (with AOF's save on your memory card). Fight with Geese Howard: Clear the game without losing a single round. After Mister Big, you'll fight Geese Howard.